Trinity Ridge Photography's Blog | We are professional photographers – Weddings, Glamour, Seniors, Rock Stars. We absolutely loved shooting Andrew and Meg’s wedding at Hunt Chapel in Rogers, AR and their reception which was held at St. Anthony’s on the Creek in Lowell. We had the privilege of shooting Meg’s sister’s wedding the year before, and we loved working with their family. 🙂 We are so amazed by our clients – they are always such wonderful people!!! Shawnna and Eric had a GORGEOUS wedding at The Crescent Hotel in Eureka Springs, AR. It was a gorgeous summer day, and this outside wedding was accented by the beautiful pink and white color scheme – so romantic. And I have to say that Shawwna and Eric were a totally darling and sweet couple – they definitely made our jobs easy! Their reception was immediately following the ceremony, and was held in the Crescent Hotel’s Crystal Dining Room. Loved the beautiful simple decor, and LOVED the oyster shots! 😉 Congrats you two!!! I have to admit, Dad and I were SO EXCITED to get the opportunity to shoot a wedding near Santa Fe, New Mexico! Isaac and Jessi are such an awesome couple. 🙂 I, personally, have known Jessi since we were in the 6th grade. So, what could be more fun that shooting a wedding for my “oldest” friend?! Nothing! 🙂 Her wedding was held at the beautiful Hacienda Dona Andrea. It was a perfect hot summer day, nothing but blue skies and sunshine! Can’t wait to see where our next destination wedding takes us! Ahhhhh….Jennifer and Jehon’s Crystal Bridges wedding was so dreamy. 🙂 ( Funny enough, it was actually on my own wedding anniversary!) It was a beautiful summer day in Bentonville, AR and we enjoyed every minute of it. Crystal Bridges is such a fabulous venue for weddings and receptions. We definitely recommend it! Enjoy! Samuel and Amanda were married on a gorgeous sunny day at Thorncrown Chapel here in Eureka Springs, AR. They were such a sweet couple! We loved the fact that they gave us some extra time after the wedding to drive around town and shoot some beautiful shots of just the two of them. 🙂 Enjoy! Wow, guys, this wedding was SO COOL. It was just Matthew and Tahnya and they had the gorgeous Thorncrown Chapel all to themselves!! PLUS, (and this is a big plus), it was STORMING. A huge storm was blowing in, and it caught us with a downpour after about 5 minutes of shooting outside after the ceremony. It was AWESOME!!! In addition to all that, I have to say, I LOVED Tahnya’s pink dress! The world should have more pink wedding dresses. 🙂 That is all. I knew I needed an awesome dress, and that there was no way I was going to spend a ton of money on one – just for my personal work. So, I thought about the amazing Sue Bryce and how she’s always talking about making her own dresses for shoots, and I thought…why not? 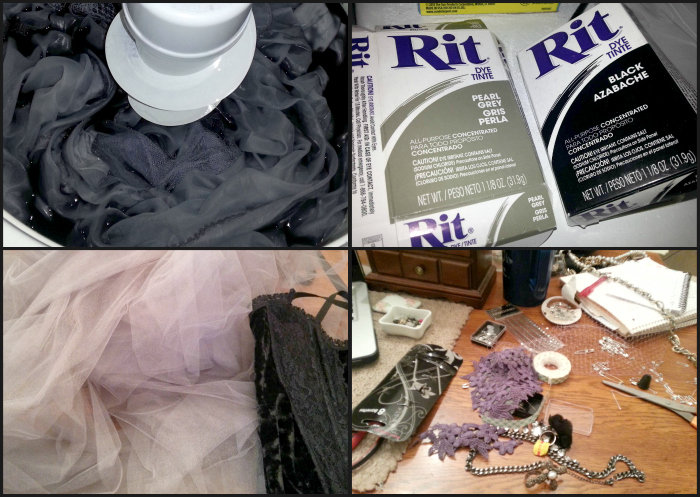 I had this vintage wedding gown I bought at a thrift store for a shoot last year ($35), and I decided that I could buy some tulle for a skirt and veil and dye them all together and make SOMETHING out them. And that’s exactly what I did. We tried to dye the dress GRAY, and it turned out purple. BRIGHT WEIRD PURPLE. (see hideous picture below) hahahaha So, we decided to cut the outer layer off of the dress. lol Also, I haven’t mentioned this yet, but I do NOT sew. I’m not sure I could even sew a pillowcase. So, the skirt is sewn, but it is SAFETY PINNED onto the dress. (You can see our initial attempt of pinning the dress onto my daughter because we don’t even have a cool mannequin thing.) 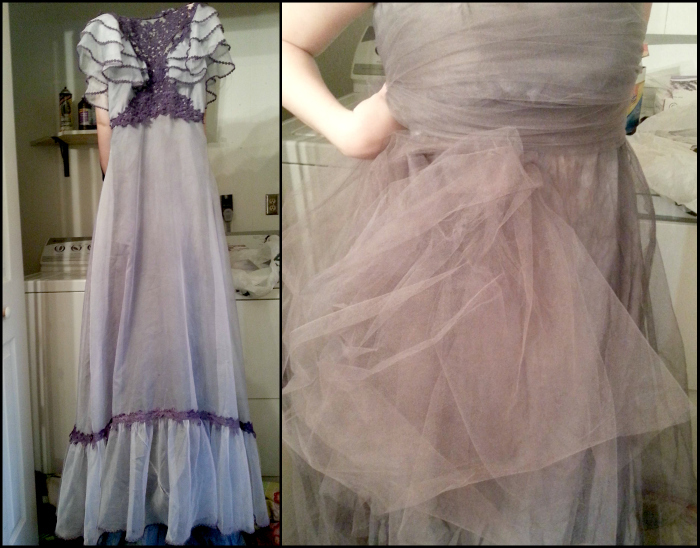 The belt is pinned to the dress as well, and the top is just tulle tied in the back. (I thought about covering the back with lace, but I ended up liking the tied back. 🙂 So, this whole process (minus shopping) took about 5 hours. It was totally worth it, but I thought for a few hours that I had completely lost my mind. 😉 Now that it’s done, I can’t wait to do it again!